Pen drive and portable USB hard disks are nowdays become a common method to transfer data between systems. But do you know that you can use any application directly from your pen drive or portable USB hard disk just by connecting your Pen drive to the any PC or laptop. Ahha you all are still in confusion, what actually i am talking about, so lets have better view. The list is little small but when you listen this installers size then you will be more shocked its only 200MB pen drive suite. Basically its a virtual OS that run from your pendrive and contains the all the applications that you need in day to day life…:P contains more than that..
Also you can add more and more portable application to your pensuite. That’s the beauty of Lupo pensuite. So no need to worry while going to other’s PC or system that he might have this software or not, keep everything in your pocket friends and enjoy the flavor of portability. 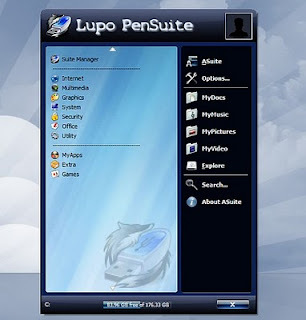 How to use Lupo Pensuite to use all applications from pen drive? 1. Download the Lupo Pensuite. 2. Install the Pen drive suite into you pendrive or portable USB hardisk. 3. Now go anywhere and just start exe to open the suite. 4. Select the application and use it directly from your pen drive.